i just download the trail version and followed your steps through 4. I can’t open my iPhone 4S 64GB backup files. It says “Invalid domain size at 3D5B:Users/tom/Library/Application Support/MobileSync/Backup/…../manifest.mbdb” can you help me on that please? Do you encrypt your backups? Yes I do. But I can see the iPhone 4 encrypted backup. 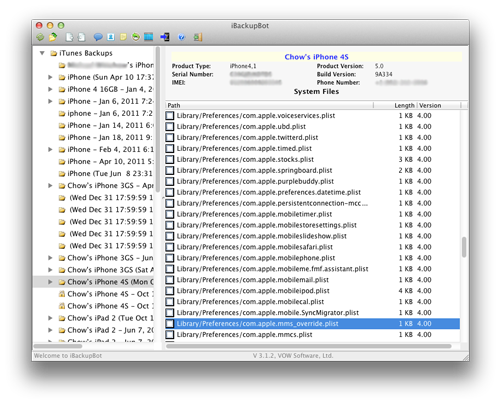 I can’t see the iPhone 4S backup rather if it’s encrypted or not. Weird I do it with my iPhone 4S. I will have to dig into it. Is it because is 64gb? I heard some 64 iPad2 have the same problem too. Do you know another way to compile the edited file back to iPhone backup file. hi i followed all your steps and now i can send and receive mms but imessage and siri does not work is it suppose to be so. I have iphone 4 on ios5 factory unlocked. Followed the procedure and now I am able to receive the mms but not able to send it. Before on ios4, I was able to send and not able to receive. Any clue? awesome it worked now if only we could do something like this for facetime and imessage without a jailbreak. mine is an AT&T iPhone 4 iOS 5 4.10.01 on Tmobile. My iMessage doesnt work or FaceTime. Download the carrier reset fix from our repo and then eject your sim card. how am I suppose to install that without cydia? It still isn’t working for me…I still can’t send or receive MMS, Facetime has worked from the start though. Could you show what the file should look like for H2O Wireless? I bought the unlocked iphone 4s from apple. There is no need to jailbreak my iphone since I bought it unlocked. How can I fix the MMS issue. Do I need to download cydia or whatever that is…. use iBackupbot. Follow our guide. I bought iphone 4s factory unlocked 32GB with the same problem; can sent but not receive MMS. I followed the instructions very carefully using ibackupbot and viola I CAN NOW SEND AND RECEIVE MMS FROM ALL CARRIERS AND ANY PHONE. Thank you so much LEI Mobile. However Group MMS doesn’t work. I am into group messaging and i really need this feature. I can do group msge with iphone but not when there’s any other phones in the group. Some of my friends don’t have iphones. Is there a way we an fix this feature for 4s factory unlocked iphones? Group message does not seem to be supported by t-mobile. We are looking for a way to make it possible but have had no luck. 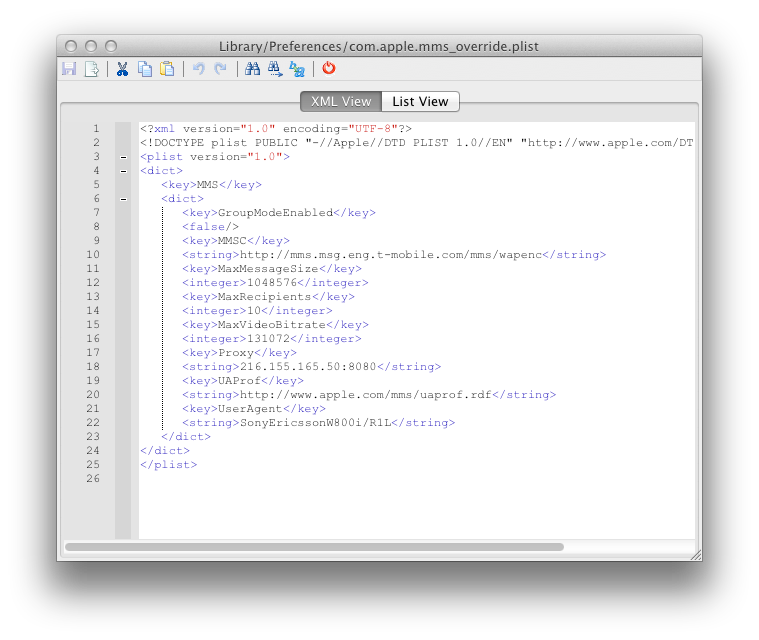 Will changing the com.apple.mms_override.plist from groupmodeenabled to make a difference. You can try it but it didn’t seem to work for me. I changed mms_override.plist from GroupModeEnabled FALSE to TRUE but no change noted in group messaging. I still cannot activate group messaging. actually I have a factory unlocked iphone 4s. Will cydia work with my iphone? Can I do it without jailbreak? I’d like to maintain a factory unlocked status of my iPhone. Yes. Follow the ibackupbot method to allow mms without a jailbreak. You cannot have Cydia and non App Store Apps without a jailbreak. Jailbreak has nothing to do with unlock except allowing you to install ultrasn0w. When a phone is factory unlocked, it is unlocked period. That will never change. Does anybody know if you do the method where you do the backup file on the computer if that restores your phone or just that mms file that you change? I have an iphone 3gs with T-mobile service. I bought off of a friend and it doesnt have Cydia or any jail break stuff so i presume it is “factory unlocked” It runs IOS 5.16.05. I copied the above formula into my iBackup and pressed restore, but it still did not fix my problem. I still cannnot send or recieve. IVE TRIED EVERYTHING!!!!!!!!!!!!!!! PLEASE HELP ME…Im so frustrated and have spent at least 12 hours of research and typing in codes, all for them to not work. Any ideas? PS: when i tried to download that file it sent me to filehippo which wanted me to take a survey or download stuff in order to use the file. Is this normal? When I used to have a 3GS mine was jailbroken and I used iFile to get mms to work. I would jailbreak it because that worked for me. 99.9% chance your phone is already Jailbroken since the only 32GB 3GS iPhones sold in US stores were SIM locked to AT&T I guess there is a slim chance your friend bought it unlocked from over seas but I suspect not. That being said if your device is JB then install Cydia and use the lei mobile repo as described above. After doing all that i press restore and than a message pops up saying ” Error Occurred, error code 19″ whats that? what should i do? You never should have paid anyone to jailbreak your phone. Redsn0w is a free App provided by the DevTeam. OK so I got Cydia up and running and now working on the MMS fix. But realized a fairly big problem. When i turn my phone off the only way to turn it back on is to run Reds0w and do a tethered boot. If i jsut try to turn the phone back on normal all i get is the apple icon. any ideas? the iOS5 jailbreak is currently tethered and you need to “Just boot” tethered with redsn0w every time your phone reboots. That’s not always easy to do if your phone reboots while away from home! Worked perfect on my I4 on 5.0.01 unlocked for T-Mobile. Click on the red exclamation and try again. If you have a bad signal this may happen. I can receive picture messages but there is no “group messaging” option in my settings. I need this option!!! Thanks. Once I get my phone and if I encounter any issues I will let you know. Also, I am guessing MMS doesn’t automatically come w/ the unlocked phone? I hear it works for some iphone 4’s and some don’t work at all. I am not supposed to put anything under Cellular Data for iBackup Bot, right? Oh, I mean for the APN settings for my phone, IF I want to use Ibackupbot. yes use ibackupbot but fill in the simple mobile settings. I will make a post dedicated to simple mobile later today. thx alot in advance and will be expecting your post to enable me receive mms finally. can’t wait…..
was able to get my simple mobile mms working on iphone 4s 5.0.1 after i followed your steps . what should i do. Now i can recieve but cannot send MMS! This is so frustrating! Any ideas? I have a 3gs unlocked and jailbreak,5.1 IOS, with simple mobile,unlimited simple mobile plan,i can’t used the data ,safari,youtube,map,! can you help me to fix it? you need to post the full settings…tmobile gave me completely different settings for MMS, but the picture you show only goes up to “servlets/”. what’s the rest of it? and are there settings for “mms us prof url”? i have an iphone 4s, on simple mobile, had trouble with receiving mms…..i did the iBackupBot, works just fine sending, receiving mms, siri,all works without issues…..
Santa brought me an unlocked 4s and my MMS now works with the above fix. I’ve searched for hours for a fix to the mms problem last year and I’ve had to live without it for the past year because I couldn’t figure it out. I stumbled upon this because I was updating my OS and I’m glad I did, just the simple fix from your repo and now I’m up and running. Thanks so much for taking the time and doing this. Worked for my factory unlocked phone =] Very easy, thanks! it keeps saying error report error -35. please help! The iBackupbot method has been tested on a T-Mobile iPhone 4S with iOS 5.0.1. MMS is working! this just worked perfectly on a factory unlocked 4S, thanks! being able to receive mms was my last hurdle. 1. I have these settings: http://support.t-mobile.com/docs/DOC-2383 and so I was already able to send mms, just not receive them. I left these settings in place when following the above guide. 2. facetime and imessage already worked for me. I’m on a T-Mobile prepaid (monthly 4g) account. The trick is to make sure you have some extra money in your account so when you try to activate imessage and facetime your phone can send and receive a few international texts in the background. Mine is updated to 5.1… iMessage will NOT work, no matter what I do. I’ve already done a full restore and have tried every trick in the book. Even talked to Apple and they can’t figure it out. It just says “waiting on activation” and is stuck there. Any advice? Lucy, the iPhone makes a couple of international texts to set up iMessage. If you don’t have enough funds available if using a prepaid plan or you have international texting blocked, it can’t finish setting up the phone. Oh… that may explain it. I do have a prepaid plan but iMessage and Facetime still worked for me when I switched from a regular plan to prepaid on 5.0 though. Last night I did a full restore thinking it would work but it doesn’t lol. I am so tired of this! Would I have to go to the store to re-activate? I am now on another phone… Am returning it tomorrow so TMobile can still reactivate the micro SIM, I am assuming? Thanks! If you deactivated the sim you will need to reactivate it or get a new one. If it still has service you can put it into a new phone and it should work just fine. Well what they did was this: Since the SIM card was in an Android that I used for like a day, the sales rep. cut it to make it into a Micro-SIM and now it’s in my iPhone now. Facetime and iMessage are still trying to activate… Let me know if you have any further details. I want to take this up to Apple but not sure if they can help. Hey again.. So I restored my phone from my most recent backup and now Facetime works. Imessage still has that error. Do you think it’s still the int’l texting if Facetime is fine or really a glitch in the iMessage system? Holy $#! @ it actually worked for receiving! I have tried SO MANY things that never worked. But now I can’t send (I could before). ARGH How can I undo this? Just uninstall? OK I tried clicking on the red (!) like a zillion times with 3/5 and 4/5 bars of service and no dice. Then at 5/5 bars eventually it worked. Dunno why it it’s so picky tho. I used to sent pics with only 2 bars before with no problem. Ah well anyway IT WORKS!! 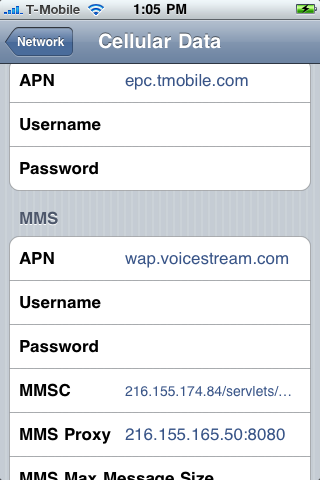 PS I have the epc cellular data APN and the wap MMS APN. For some reason it’s not working for me, I must have tried at least 4 times. And I noticed that its because iBackupBot isn’t saving the newly edited plist…has anyone had that problem or can try to help me please?? it’s not working for me, I must have tried at least 4 times. And I noticed that its because the newly edited plist isn’t being saved…has anyone had that problem or can try to help me PLEASE! I can receive picture messages, but when I go to send progress bar gets 90% of the way there, but message does not go through. Any ideas? iPhone 3GS 5.1. Thanks. Seems like your repo is down and i am not been able to install via cydia, can you please help ? Got a 4 running 5.1.1 with 4.10.01 preserved baseband jailbroken and with a gevey working on Tmo my son. After countless settings… I tried this and now it sends/receives MMS. Hope this works for some of you folks as well. I tried getting iMessage and Facetime to work. Found some intructions, did it and it ended up deleting my MMS settings and the camera icon was gone from the text part. Had to go back and delete the iMessage/Facetime stuff and enter this MMS info again. It’s working just fine the second try. I have an iPhone 4S running ios 6. I followed the iBackupBot steps above exactly but the MMS still does not work unless the “Cellular Data” is turned on. I thought the whole point of this was to get MMS to work without using the data plan. Am I missing something? Please help. Do I need to fill in the APN information?? That wasn’t mentioned in the iBackUpBot steps. Yes you do and then make sure to reboot. So I’ve tried switching APNs, rebooting, etc..nothing seems to work. I am wondering if this might have anything to do with the fact that I’m on a prepaid plan. Has anyone gotten this to work using a prepaid T-mobile plan?